An established financial services company, Equitem knew the best way to deliver world class service for their clients. But when it came to their email, they were the ones who need a better service. And that’s where SaneBox came in. Equitem Financial Services is a leading financial services firm in Australia and has a reputation for their solid financial advice and efficiency in managing their clients. But as their firm grew, they realized managing their email was become a problem. As a business owner, Ellison knew it was important to continually research ways to increase efficiency and productivity within his team. It was during one of these research sessions that he stumbled on the solution to his email issues—SaneBox. “We were actually looking for a range of software solutions to address a number of operational ‘time-wasters’, and came cross SaneBox through research as opposed to looking specifically for an email management tool, but we’re glad we did,” says Ellison. Once Ellison implemented SaneBox, he noticed an immediate shift in the way his company handled emails. I. Thanks to the SaneBox BlackHole, his team could quickly and easily unsubscribe to unnecessary emails that were taking up space in their inbox. This ensured that important emails got immediate attention and no critical client communications fell through the cracks. SaneBox has also allowed the Equitem team to take back their time and refocus their energy on the work that really matters. “​Separating emails that need action from those that are for information only has saved a lot of time and allows us to focus on only what’s most important,” says Ellison. Today, SaneBox is an indispensable part of Equitem’s business operations. “[We] have been using it for over 5 years,” says Ellison—and, thanks to SaneBox, their inboxes have been in control ever since. Ready to find out how SaneBox can help you take back control of your inbox, skyrocket your productivity, and get more done during the day? 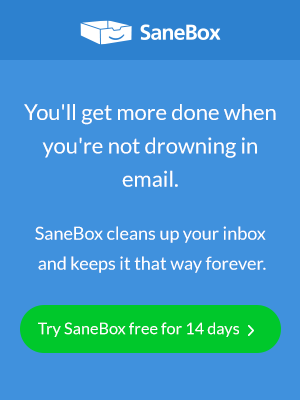 Sign up for SaneBox teams and experience firsthand how SaneBox can revolutionize the way you look at your inbox—and ensure you never miss an important email again. Next Entry Email Management: How is SaneBox Is Different From Google Priority Inbox?